Material Of constructions can be provided as per request for wire mesh conveyor belt materials based on overall belt strength, cleaning conditions with Stainless Steel, Mild Steel mesh etc. Can be useful in the high-temperature bakery, baking, snacks food conveying or for frozen food conveying. Conveying of lightweight products such as wool,t obaccos, baking and roasting applications; sugar confectionery, roasted products. Wire mesh conveyor belts serve for industries like pharmaceuticals, Packaging, Salt, Glass, Furnaces, Food processing, Chapatti, noodles, namkeen etc. 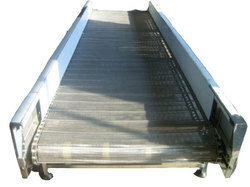 Wire mesh conveyor can be supplied along with clits, levels for fixed product spacing. We are one of the leading manufacturers & exporters of Wire Mesh Conveyor. · Material Of constructions can be provided as per request for wire mesh conveyor belt materials based on overall belt strength, cleaning conditions with Stainless Steel , Mild Steel mesh etc. · Can be useful in high temperature bakery, baking, snacks food conveying or for frozen food conveying. · Conveying of light weight products such as wool, tobacco, baking and roasting applications; sugar confectionary, roasted products. · Wire mesh conveyor belts servesfor industries like pharmaceuticals, Packaging, Salt, Glass, Furnaces, Food processing, Chapatti, noodles, namkeen etc. 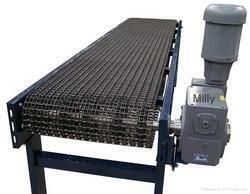 · Wire mesh conveyor can be supplied along with clits, levels for fixed product spacing. We are one of the preeminent organizations, engaged in manufacturing, supplying and exporting a wide range of Honey CombConveyor Belt. These products are available in various sizes, shapes and designs at market leading prices to fulfill the demands and needs of customers. Furthermore, we have a team of expert quality controllers, which checks all the products on various parameters to ensure flawlessness.